Linux Mint 18.2 “Sonya” KDE released! The team is proud to announce the release of Linux Mint 18.2 “Sonya” KDE Edition. Linux Mint 18.2 is a long term support release which will be supported until 2021. It comes with updated software and brings refinements and many new features to make your desktop even more comfortable to use. “What’s new in Linux Mint 18.2 KDE“. Announcements will be made shortly with instructions on how to upgrade from Linux Mint 18 and Linux Mint 18.1. Previous Previous post: Linux Mint 18.2 “Sonya” Xfce released! Honestly, this is the first time i enjoy actually using a KDE distro. With 18.2, something has just clicked into place, regarding the desktop. Running 18.1 and 18.2 side by side, it suddenly has that “Je ne sais quoi”, and I’m not exactly sure why right now. P.S. Linux Mint really needs to become the default desktop OS in the NHS in the UK, going forward. Let’s make it happen folks. Thanks everybody for this excellent KDE distro. Very well done. I will give it a try! Sounds amazing! Not working on ryzen system,only shown boot screen. Thank you for the announcement. I am very satisfied with Linux Mint KDE. The installer on Linux Mint KDE Live DVD has an little error: it does not install the package “language-pack-kde-de” and so you have an mix of languages in applications (English and German). This is an issue in Austria. I got a lot of time to solve this issue to look into the wiki.ubuntuusers.de. All other matters are very fine. Thank you. Part of me wishes you wouldn’t announce the release without upgrade instructions. I’d actually rather not know about the new release until there were upgrade instructions, it just feels like a tease otherwise. For the future will be better to change a little bit the software manager by adding a button install under the name of the program. 3 clicks are needed to install a program now! What about one! I do not think it can be complicated! And a system restore program is also needed. I convinced 11 people to use LM with 2 arguments: to install a program is the same like in Android and if something goes wrong they have a possibility to restore the system. All the new users are comming from Windows and the only program for them is systemback which is very simple. The program was abandoned so will be nothing here for the next system, LM 19! I think this problem can be also solved. Weird thing happened to me with Folder Color on Linux Mint 18.2 I change the folders color in Home. The icons set was Mint Y. By changing color to blue, all the folders in Home switched to another icons set. Mint X Blue or something. Then, when trying to use another icons set I had just installed (La Capitaine), it was impossible to change the icons in Home. Everywhere else was fine, but not in Home. I could never go back to default Mint Y green. Dear linux Mint team,why 18.2 doesn’t work on ryzen system like 18.1?what its happening,it reach at boot screen and nothing happens. Edit by Clem: It could be a kernel regression? In any case, you can install 18.1 and upgrade it to 18.2 without changing the kernel. Edit by Clem: Different desktop environments and sets of applications. Don’t work for me. How to update? Thank you very much Clem. How do I become a member of this forum. No slide show on the installer. Don’t really care, just an observation. I booted from the install USB stick and loaded the Broadcom wifi driver using Driver Manager, did the install. Then tried to install the driver from the USB and got an error “check your internet connection”. This worked properly on LM Xfce 18.2. Update Manager menu bar icon does not open without right clicking on it. This also worked properly on LM Xfce 18.2. How can I get rid of the annoying beep when I use my keyboard keys to adjust the sound volume. LM is the only Kde distro that I’ve tried that has this “feature”. I have asked on the forums about this in the past and nobody seems to know. Otherwise an excellent job Mint team. Whoo Hoo! I cant install profile for my display created in DisplayCal ! KDE dont support any color manage system ? In monitor setting dont see any icc profiles and cant change it ! Muchas gracias, disfruto mucho usando esta distribucion de linux y el escritodio kde es excelente!! saludos desde Chile santiago!!! I’m hoping this will fix all the annoying “glitches” that currently exist in v18 on my XPS15 – little things like the machine not powering off when hibernating are REALLY FRUSTRATING!! Also, @Adam Jarvis, right-on! I’ve been lamenting the ridiculous use of pissy Windows in the NHS (and frankly any Government or public entity) for years, ranting at anyone who would listen that “they’re overly costly, and a security scandal just waiting to happen!” – I feel like that cliché guy in the movies with a “the end is nigh” sign as it starts raining fireballs from the sky! Wine is broken in this release. emisisoft reports malware while downloading this ISO. also made avast in macossierra stop downloading same file. i will run customary security scans and hash check. @Jiri S. Mint uses sudo not su. There is no root account in Mint AFAIK. @Jiri S and @Capn+richard, I’ve just tested and confirm that there’s no su in Mint, and in KDE-Neon as well. Even more, it shows to have been not possible to open anything by the app as root in Plasma since 5.10. Only sudo of the terminal commands is allowed there. Looks like I will have to wait for 18.3. My Lenovo T520 keeps giving me some error during startup and shutdown “flip_done time out”. Tried different kernels and with the Intel and Nvidia gpu enabled. Ok,so after a reinstall 18.2-kde, it seems to be behaving much better. I think my problem was I installed it on a t410 and then moved the hard drive to my t520. This is an efi install booting windows 10 and mint 17.3 on separate hard drives in a cdrom caddy. I’ve problem to configure my epson perfection V500 photo scanner. can you help me? I’m still having problem to configure my Epson perfection V500 photo scanner. i’m waiting for some help. 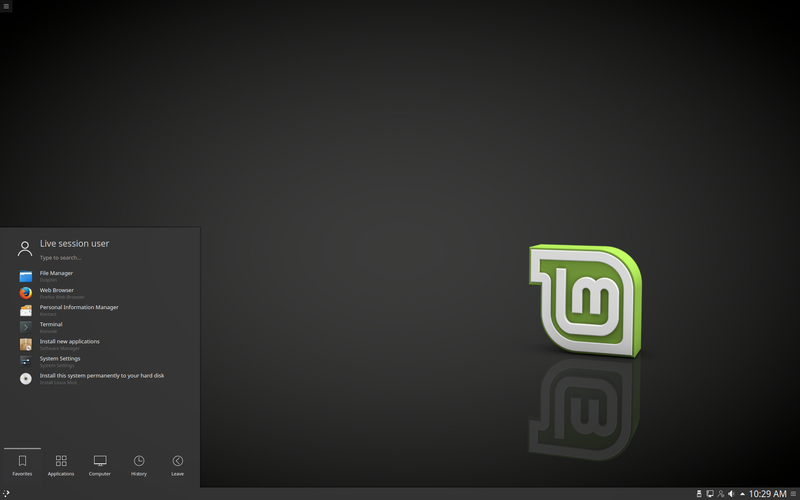 I LOVE Linux Mint! I don’t know much about working it yet, but it makes more sense than anything in MS Windows! I’ve tried the Cinnamon 18.2, great stuff! But just started a few weeks ago with KDE 18.1 and loved it! Just something about that desktop speaks to me inner need to make things mine, So slick, sleek and as dark as I like. Plus the list of options goes on forever! So I installed 18.2, didn’t even wait for the upgrade! Thank you Linux Mint team for thinking about Millions and Millions of people fleeing Windows! Think you for all of the “flavors” of Mint you offer! This is so much fun! First of all thank you for you work. I have got a Nebook Exon E15 Cloud I must tell you that I installed the Mint 18.02 Sonya 64 and I have not been able to connect to the wifi and that is a great pity !!! Bravo on this release. You guys have outdone Kubuntu with a sleek and modern looking distro. No joy installing in HyperV Win10 version. Install shortcut missing on the ISO I downloaded, so selected the menu listed option to install permanently. About 10 to 15 seconds of a spinning mouse icon yields nothing. No HD activity. Tried the MATE version; install icon is on desktop with this ISO but it’s non-responsive. Right-click run as admin causes the spinning icon for 10 to 15 seconds. Going to try a flat file VHDx instead of dynamically expanding; though don’t see why this would matter. Want to bone up on Linux after being away for quite a few years; this appears to be the go-to. I don’t recall issues virtualizing Linux in the past. Anyone else trying this and having success? Happy with this, closer now to dumping all things Microsoft and google. Few bugs but it would be boring if there wasn’t any wouldn’t it? LM18.2xfce64bit, the ‘invalid password’ bug at the end of installation is real and a serious showstopper. i am on my 3rd attempt, after which i will abandon. i have used 17.2 for a couple years and didn’t have this problem. Very many thanks to Clem and the team. After playing with GNU/Linux a few times I have now taken the plunge and totally taken MS Windows off the computer and installed LM Cinnamon 18.2 . Very impressed with it and so grateful to the GNU community – and pleased to have made a donation to LM. 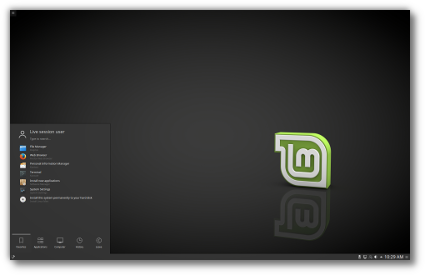 I’ve tried several distros but have finally settled on Linux Mint.